Faiez Serraj has told a visiting Russian delegation, headed by Moscow’s deputy foreign minister Mikhail Bogdanov, he is keen to sign economic cooperation agreements that could make use of Russian expertise. This could include energy, railway and infrastructure projects and Russian advice on military and security issues, a statement by the Presidency Council (PC) said. 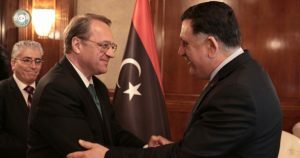 Serraj also asked Mikhail Bogdanov for his country’s support in lifting the UN arms embargo on Libya and called on Russia to help mediate in the current conflict in the south. Bogdanov described his Tripoli meeting yesterday as a follow up to Serraj’s visit to Moscow in March, as they sought a way out of the current political stalemate in Libya. Both sides also looked at measures to combat terrorism, human trafficking and organised crime. Their meeting followed a similar discussion yesterday between PC deputy Ahmed Maetig and the Russian delegation. Talks covered economic cooperation and an evaluation of the current military situation. Also present was the head of the Presidential Guard Colonel Najmi Al-Nakua and Russian ambassador to Libya Ivan Molotkov. Bogdanov’s visit comes less than a week after a mainly Misratan delegation travelled to Moscow for talks with Bogdanov and the Russian parliament. It was a busy day for the PC chief with Serraj also welcoming UN envoy Martin Kobler, fresh from his trip to update the UN Security Council on Libya. Kobler reiterated his common line that the international community believes the only solution can “at the negotiating table” and not through force. Serraj agreed that only dialogue would prevent a military escalation and would help the declaration of a ceasefire in the south, a PC statement said. The UN envoy had told the Security Council in New York that Libya was heavily divided which affected the ability of many state institutions to function properly. Violence, criminality and social unrest were also rife he said. High on the agenda was Sewehli’s surprise Rome encounter with House of Representatives (HoR) head Ageela Saleh and the furthering of political reconciliation it appeared to demonstrate. With the HoR and State Council teams making up the Libya Dialogue, Kobler praised the Rome talks and described them as a “good step to build on and advance LPA (Libyan Political Agreement) implementation. It also emerged that Kobler had a meeting with Bogdanov while both men were in Tripoli. The UNSMIL chief messaged afterwards that he welcomed the “positive engagement of Russia in finding a solution for Libya crisis.” The Russians did not comment on the encounter.